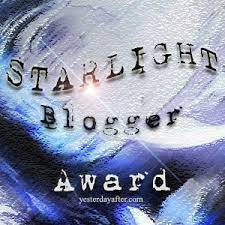 I would like to thank ColdChickenSoup for nominating me for the Starlight Blogger Award. If you could meet anyone from throughout history. Who and why? I would love to meet Chuang Tzu because I am fascinated by his philosophy, and perspective on life. I actually have many favourite books. Recently I read again David Gemmell’ s Lion of Macedon and I find it is a wonderful story which pulls me in everytime, and I could not stop reading it until I was finished. I love the development of the characters and the story. Who is your favourite fiction character from any medium and why? Doctor Who from TV and books is my favourite fiction character. I love the way his character changes over time through the diverse actors who have portrayed him. Each actors’ interpretation of the doctor enriches our curiousity about him and that makes me wanting to learn more. 1) What is that one place that makes you feel nostalgic all of a sudden? The English Garden in Munich makes me nostalgic because it has given me many memories, and inspired me in countless ways. Every time I go there I get swept away by fond memories and wish they could happen again. The sad thing is that it is extremely unlikely to happen. 2) Who is your favorite author and why? Terry Pratchett is my favourite author. I love how he uses words to build a world, and make it come alive. The characters in disk world feel to me like friends. It is a tribute to his talent in his writing that many readers care about what happens to them. 3) What is/are your asset/s? I am open minded and have a sense of humour. 1) If you could choose to be a fictional character in any medium; who would you pick and why? 2) Have you ever read anything, that you at first did not like but later changed your mind about it. What book was it and what made you change your mind? 3) Do you have a favourite poem? If yes, who wrote it and why do you like it?